Tucked away in historic Bloomsbury, London hides Central Saint Martin's graduate, Kate Halfpenny's exquisitely styled bridal boutique - HALFPENNY LONDON. Lace, tulle, satin and silk billow from the minimal floating rails; all delicately beaded, ruffled, expertly cut. Atop an original fireplace; which is scattered with eclectic objects d'art; sit's a neon light. An owl mask adorns the wall, with the odd antique doll or bell jar containing a perfectly embroidered accessory. At once, this perfectly formed shop appears haunted by the willowy ghosts of fashion past, but is somehow staunchly contemporary. 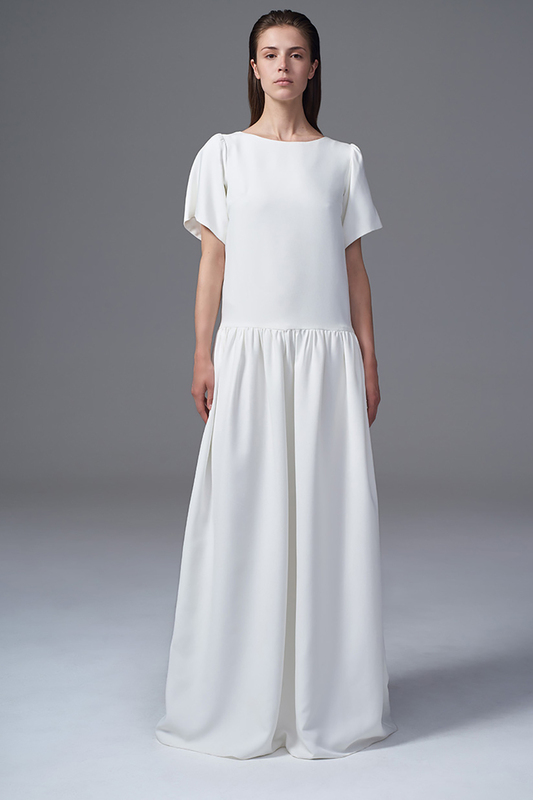 With beautiful and unusual paradoxes in design, Halfpenny gowns are pared down despite their vintage inspirations. There are no meringues in sight. Welcome to the future of wedding dress design. 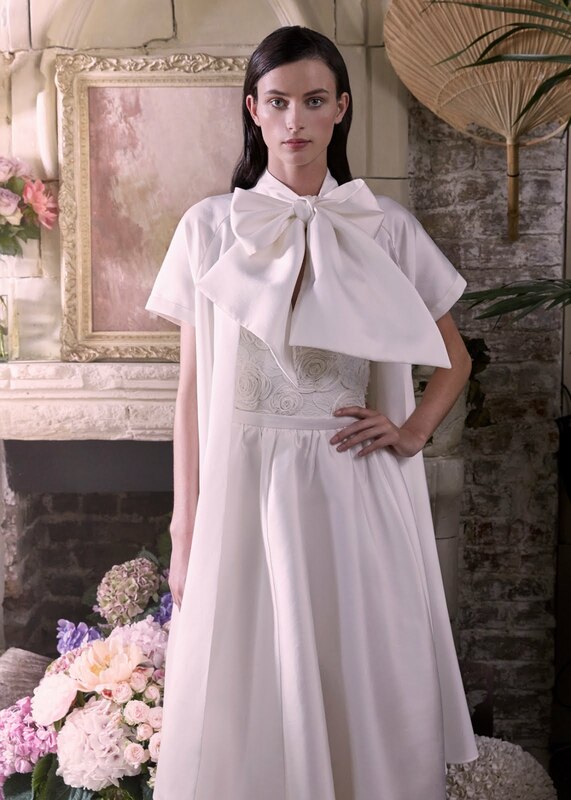 2017 sees Kate Halfpenny launch her new collection, Wild Love, "a carefully curated collection of timeless classics... dresses and bridal separates with Kate's signature style, beading and embroidery". Taking inspiration from "a wild English rose garden in the intricate detail of the flowers, and the layers of delicate fragrant petals that evoke memories of summer; the contradiction lies in the graphic shapes of oblongs and circles for the expertly tailored pieces". We are very excited to be showcasing Halfpenny's new pieces at our London 2017 show, which Kate and her team is kindly sponsoring. I am sure you will agree, their expert blend of the old and the new is uniquely timeless. We caught up with Kate and her team in the run up to March's fair, to talk Emilia Fox, lace curtain daydreams and more! I've always been freelance, so it was a natural progression to launch my brand. It's been the most exciting journey! It was after actress Emilia Fox wore one of my silk floral dresses on her wedding day, that Halfpenny London was born. Inundated with requests, and following a subsequent Vogue interview, I founded my eponymous wedding dress brand. What has been the coolest/best moment of your career so far? I have so many exciting and cool moments, as I work in the best industry, but a couple are opening my store in Bloomsbury - I still pinch myself that it's real - and dressing Kate Moss for her birthday in 4 bespoke gowns that I designed for her. She rocked it and still wears them to events now! I'm inspired by everything around me, from architecture to fabrics. The other day I was lying in the bath at my house in Whitstable, and sat staring at the old lace curtains that I've darned so many times. That has inspired a dress for the new 2018 collection. 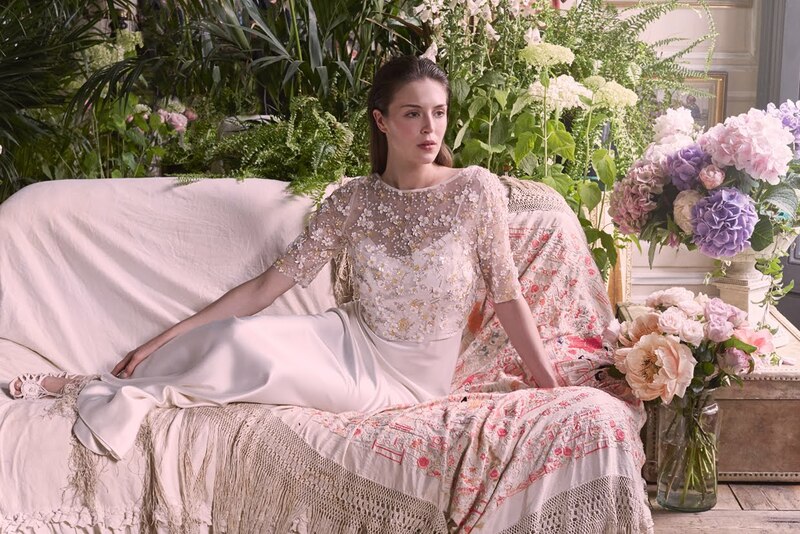 Beautiful handcrafted pieces made in London, unique dresses with the signature low back details, incredible fabrics and embellishment that Halfpenny is known for - that's all you need to know! Don't forget to purchase your TICKETS for the London 2017 A Most Curious Wedding Fair, and come marvel at the magic of Halfpenny's delectable anthology of pretty pieces for yourself.